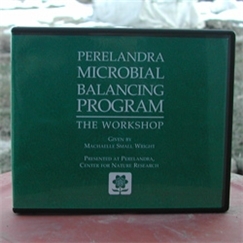 DVD: Microbial Balancing Program - The Workshop - Perelandra Ltd. This is the DVD format of the previously released MBP Workshop video. This DVD set doesn't include all of the bells and whistles of the other DVDs like chapters and menus. But we thought you'd appreciate having this video on DVD sooner than we could put in bells and whistles. The Microbial Balancing Program is a radically different and extraordinarily effective health program that addresses all infectious disease and microbial imbalances. It will change the way you think about microbes and give you an extraordinary tool for addressing any infection (serious or small) that you may be experiencing with amazing efficiency and success. And this workshop will knock your socks off! In it, Machaelle "exposes" the secrets of the microbial world with her exceptional, eye-opening understanding of the big picture. As she details their existence and impact, not only within the human body, but in every aspect of the planet since the beginning of time, she helps to open our eyes to these invisible and extremely powerful allies. Not only does Machaelle explain the details of the Microbial Balancing Program, she introduces two processes. The first proces (Beginner's Phase 1 Testing) makes getting into the program effortless, and the second one (MBP Telegraph Testing Process) allows you to do microbial balancing with laser-like precision. Taking this work to a new level, it is especially helpful to anyone with chronic health problems. This workshop is a great introduction and support for those just getting into the Microbial Balancing Program, as well as for those already working with the Program. And if you are one of the brave people who tried MBP when it was first released in 1996, but still haven't updated your Manual to the second edition or you are still hesitating to use it, this will definitely give you motivation. Includes a bonus instructional DVD on kinesiology (muscle-testing).